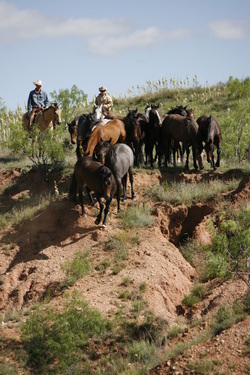 River Breaks Ranch is a family operation that has been in continuous existence for the past 95 years. Over the years, River Breaks has operated in 3 states; Texas, New Mexico and Missouri, but currently solely operates in Texas. The ranch is a working commercial ranch that produces wheat, cotton, and oil; raises cattle and horses and may soon be producing energy from both wind and solar. In 2003, I formed a partnership with my parents, Bill and Sherri Cornett, to diversify the operation and allow tourists to experience the ranch. As the managing partner, my initial step was to build a 5,000 square foot party facility on the home place to entertain guests. “The Barn” as it is called at the ranch is far from a barn. The first glimpse of “The Barn” reveals a massive 2,000 square foot screened in porch complete with a waist high native stone wall supported by rock columns. Passing through the screened in porch, guests walk into the main dinning area which has polished stained concrete floors, textured walls and western art displayed museum style. The main room comfortably accommodates up to 180 people in banquet style seating. My original focus for the ranch was to steer the tourist traffic to River Breaks where they could get a true feel of Texas hospitality while enjoying unusual surrounding. This potential market included travelers coming to the Panhandle from all over the world. 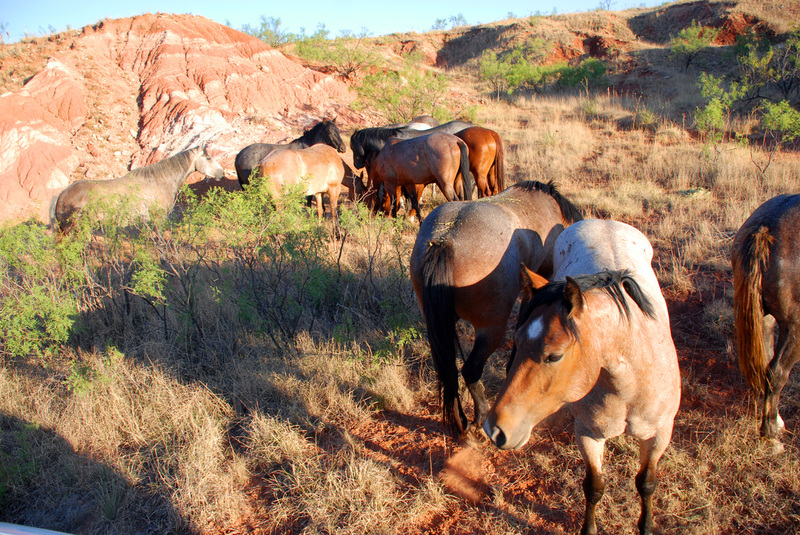 With the help of the Amarillo Chamber of Commerce, the Conventions and Visitors Counsel and the Texas Visitor Information Centers, River Breaks Ranch has done a thriving tourist business. However, during this time, I discovered the greatest concentration of customers were right in the heart of Amarillo. The ranch’s target audience became not as much the tourists, as expected, but the locals. River Breaks has filled a need within the party venue sector that was lacking in the Amarillo community. Being just 7 miles north of Westgate Mall has been a competitive advantage in the Amarillo market. 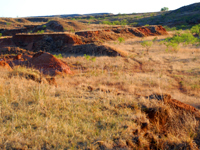 The proximity of the ranch to Amarillo guests brings the ranch close to its Amarillo customer market. Ranch guests get the feel of being away from the hustle and bustle without venturing far from Amarillo. They can relax in the quite tranquility of a country setting overlooking the Spanish skirted canyons of the Canadian river breaks. 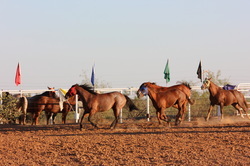 Not only does the beautiful setting make our ranch a unique destination to host private parties, business conferences, reunions, and wedding activities but River Breaks Ranch also offers unusual activities which set it apart from other venues in Texas or even the entire nation. With wagon rides, cattle stampedes, horse racing and team roping, guests can experience entertainment up close that is unmatched by any other location. For the gambler in everyone, horse racing, the sport of kings, always creates fun and excitement. At River Breaks, the thrill of winning takes over and the agony of defeat is eliminated. Each guest receives a packet of monopoly like money that I call “Ranch Bucks” which the guests use to bet on the horse races. A full racing card consists of 5 races run by 2 and 3 year old colts. Each colt races without a rider so there is no chance a jockey can “fix a race.” Every colt has a different colored racing blinker that makes it easy for the guests to distinguish the colts. In the first four races, each race has four colts running. The fifth and final race has all 8 horses running. In every race, I pay 10 to 1 odds for the 1st Place winning horse. At the end of the races, a trophy is awarded to the high money winner of the day. Over the years I have seen several winners who literally became “Ranch Buck Millionaires”. Team roping does not produce Ranch Buck Millionaires, but it does provide a real authentic taste of Texas fun. 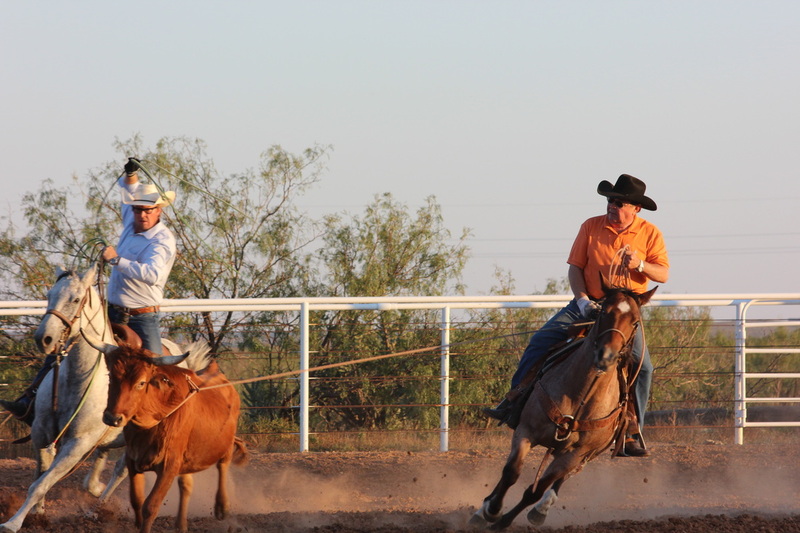 Just like the races, team roping is a very popular activity for groups with out-of-towners. Roping is also the “go to” activity for rehearsal dinners, family reunions and locally hosted conventions. 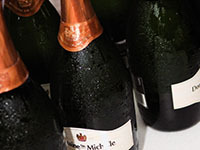 Through the years I have hosted a number of groups both local and international. Many of the local civic clubs such as Rotary and Ambucs have become regulars at River Breaks Ranch. Fundraisers at the ranch have been successful and distinctly different with real Texas flair. Even love has flourished at the ranch where numerous couples have begun their married life with a wedding surrounded by a spectacular sunset backdrop. Not only is the backdrop the attraction at the ranch, but often it is the mouthwatering food. When your nose catches a whiff of a steak sizzling over a mesquite fire you know two things: You are in Texas and you are about to eat a fabulous steak. That smell will lead you to the best steak in the Panhandle as proclaimed by the award River Breaks Ranch received in 2009 from the Texas ______________. At River Breaks all of the meat is cooked outdoors over an open fire giving that unique flavor that is often attempted by others, but perfected by River Breaks. Steaks are just the beginning. Our menu includes entrees such as maple syrup glazed smoked salmon, cuatro rubbed brisket, whole orange glazed roasted pig (with the obligatory apple in its mouth), and mesquite grilled fajitas that will make you say “Ole” as well as an array of mouth watering appetizers. In 2009, River Breaks’ demand gave me the opportunity to expand our facility. The newest addition was completed in April of last year with the addition of a 4,000 square foot flagstone deck on the back of the building overlooking the ranch canyon. The new deck can accommodate over 300 people seated banquet style, outdoors with a beautiful view of the on site canyon facing our spectacular Panhandle sunset. I can now boast that River Breaks truly has “The Biggest Deck in Town”. River Breaks Guests are From Everywhere! Experience” that showcases Amarillo’s contemporary western lifestyle to both locals and visiting guests. River Breaks Ranch has hosted the best Texas parties anywhere within a warm and friendly atmosphere. 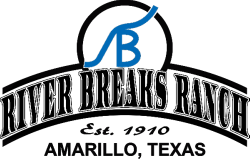 I believe that Amarillo has a one of a kind entertainment facility and destination at River Breaks Ranch. Now that the secret is out of the bag, River Breaks Ranch is no longer the hidden treasure of the Panhandle. Come joins us at River Breaks where “the deer and the antelope play”.